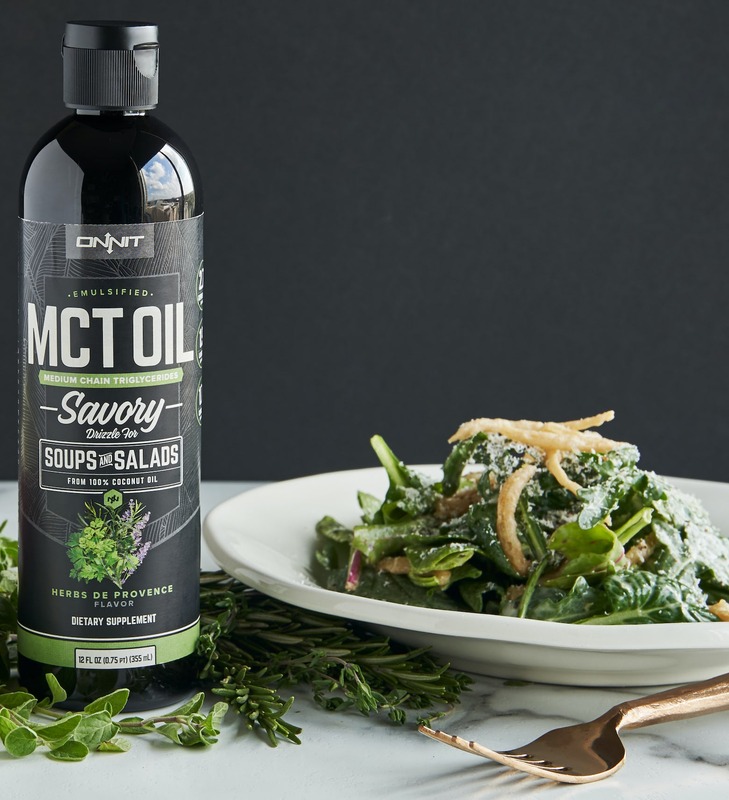 More than 70% off, our line of Savory Emulsified MCT Oils are a steal during our Black Friday sale! 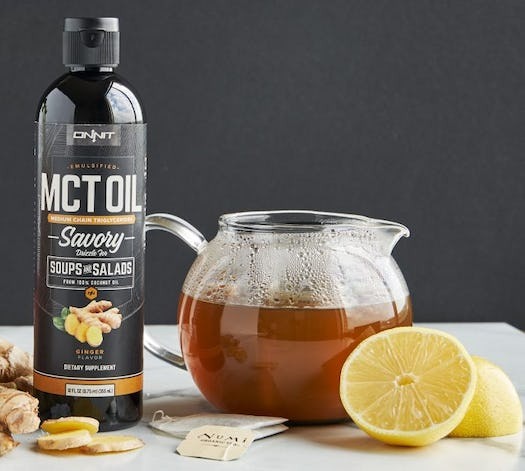 Emulsified MCT oil gives you all the benefits of MCT oil in the most convenient way possible. Simply add one of these savory flavors to a beverage or other liquid, hot or cold, and stir to mix evenly and instantly—no blender required. Our proprietary emulsification technique utilizes a combination of air and water that allows fats to disperse evenly in liquids. MCTs are one of the cleanest fuel sources available for the body, supporting energy and a healthy metabolism. Our line of savory flavors provides more opportunities to incorporate healthy fats into your diet. The options are endless. With three delicious flavors, Herbs de Provence, Ginger and French Onion, savory emulsified MCT Oils can be added to your favorite meals and beverages. 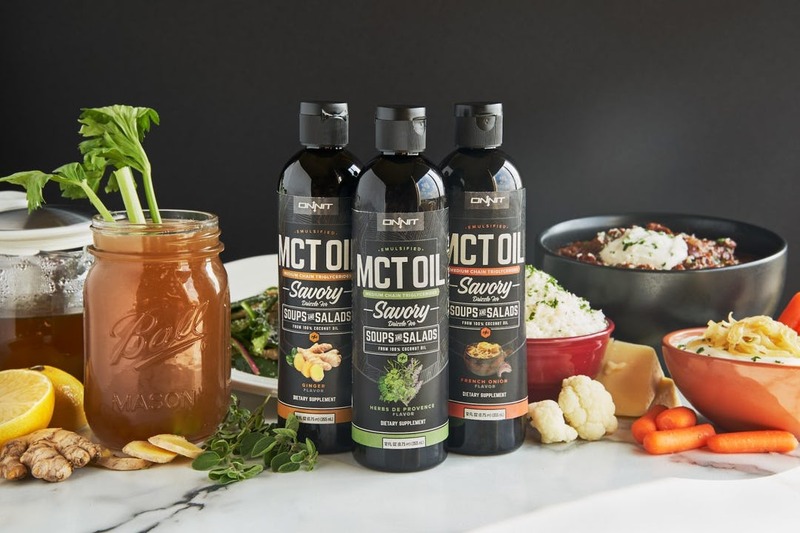 Stir emulsified MCT Oil into gravies, dips, sauces, soups, stews, teas, salad dressings, bone broth, and more! One thing to note: emulsified MCT Oils cannot be cooked or overheated due to a low smoke point, so add them after cooking and enjoy! Herbs de Provence is a delicious compliment to pretty much any salad dressing. While creamier store-bought dressings like ranch and caesar are usually full of hydrogenated oils and chemicals to increase shelf life, there are healthier alternatives with the same great taste. 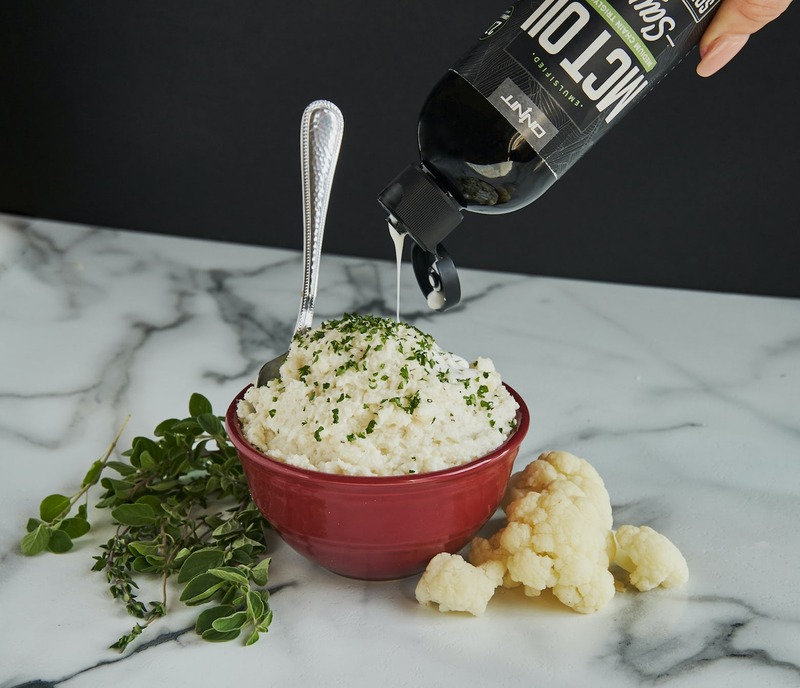 Our favorite is Primal Kitchen’s line of dressings and marinades made with avocado oil. Simply stir your favorite flavor EMCT with your dressing of choice, then drizzle and toss in salad. 1) In a small dish, stir the the caesar dressing and emulsified MCT oil until combined. 2)Drizzle dressing over fresh leafy greens. Toss to coat evenly. Top with crispy onions or pork grinds, fresh grated Parmigiano Reggiano, and freshly ground black pepper. Serve with grilled wild shrimp or grass-fed steak for a complete meal. You won’t miss mashed potatoes. Fun fact, cruciferous vegetables contain a precursor to a compound called sulforaphane, which can eradicate carcinogens (cancer-causing substances) and seriously reduce inflammation (underlying factor in most diseases). When you cook these veggies though, you deactivate the enzyme needed to absorb sulforaphane. However, mustard seed powder has a stable form of this enzyme called myrosinase. Moral of the story: add mustard seed powder, which is found in the spice section, to all of your cruciferous veggie dishes. Cruciferous vegetables include: cauliflower, broccoli, kale, collards, cabbage, Brussels sprouts, arugula, watercress, cabbage, and more. Herbs de Provence is the perfect flavor addition to this recipe. 1) Bring a large pot of water and salt to boil, then add the cauliflower florets. Boil for 6 to 8 minutes until you can easily pierce it with a fork. Strain. 2) Add the cauliflower and remaining ingredients into a food processor. Pulse until smooth. If you want a chunkier version, pulse in short 5-second increments. If you like more creamy and smooth, pulse continuously. 3) Garnish with fresh herbs, and serve warm. Bone broth has been a hot ticket item in the nutrition world lately. Check out this article to read more about the benefits of this collagen-rich drink. We optimized the recipe by adding Ginger Emulsified MCT Oil and a dash of cayenne for an extra little kick. *Read this article on the benefits of bone broth and the highest quality sources. 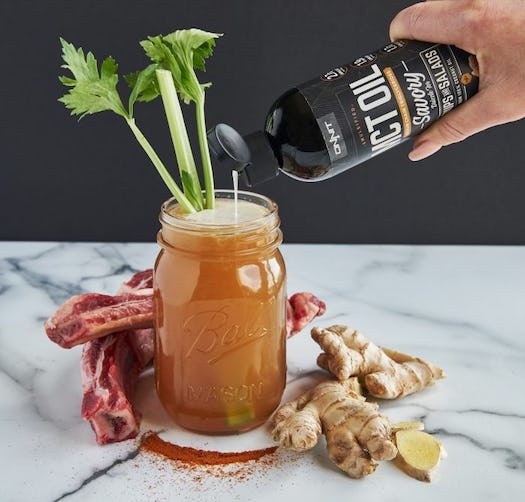 **All three savory flavors pair nicely with bone broth, so feel free to switch it up! 1)Heat bone broth on stove top until simmering. 2)Stir in EMCT and cayenne pepper. Sip warm. Stir in EMCT and lemon juice in tea. Sip, enjoy, relax! 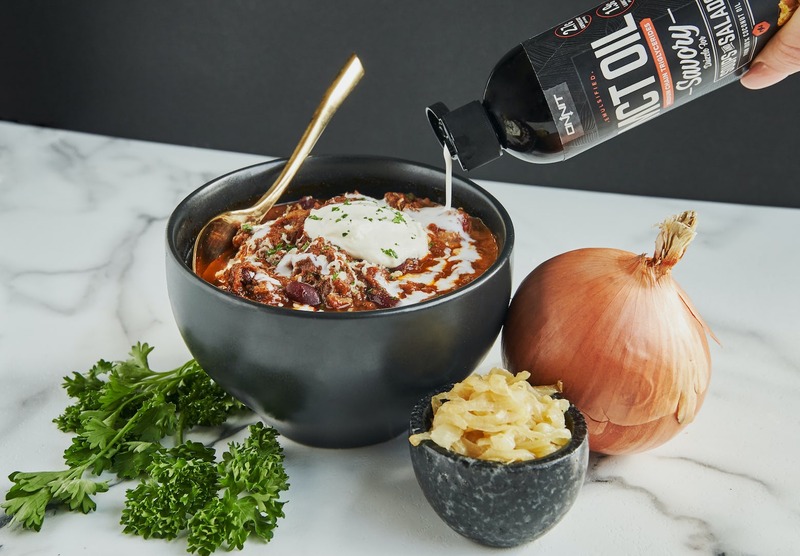 Whether you choose to make your own chili or buy a cup (with grass-fed beef of course) from the hot buffet station at the grocery store, this go-to winter meal just got even better. Stir in a tablespoon of French Onion emulsified MCT Oil after heating, top with full-fat plain yogurt or sour cream, chopped chives, maybe a little shredded cheese, and life is made! *remove if you don’t like too much heat. 1) Heat 1 tbsp. avocado oil in a large pan or cast-iron skillet over high heat. Add the brisket, and sear quickly on both sides to get a nice golden brown. Transfer to the bottom of the slow cooker. 2) Slice the Warrior Bars in half lengthwise, then into small ½-inch pieces transversely. Add to the slow cooker. Then top with onion, kidney beans, crushed tomatoes, beef broth, and spices. 3) Cover and cook on high for 3-4 hours or low for 5-6 hours, until you can easily shred the brisket with two forks. Depending on the cut, size, shape and amount of fat on the brisket, cook time may vary. 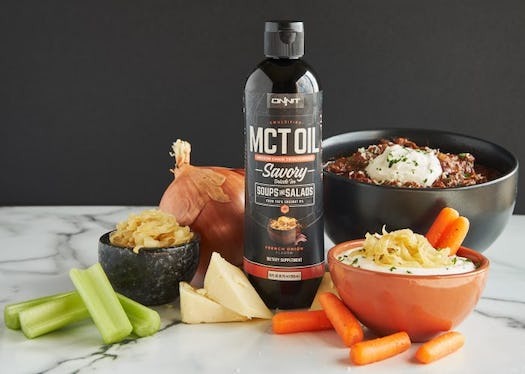 4) Before serving, stir in French Onion Emulsified MCT Oil (can be added in individual servings alternatively as well). Serve warm with desired toppings. This is match made in Heaven. We created a probiotic-rich version of this classic dip, stirred in its identical twin flavor, and served it with raw veggies and healthy chips. Boom, instant party maker. *Substitute with organic sour cream if you are following a low-carb or ketogenic diet. 1) In a saute pan over medium heat, add the sliced onions, olive oil, and butter. Stir often until the onions begin to caramelize, or turn a deep, golden brown. Be patient, this may take up to 20 minutes. 2) Turn off heat, then stir in Worcestershire. Let onions cool. 3) In a medium mixing bowl, add the mayonnaise, yogurt or sour cream, garlic powder, salt, pepper, and cooled caramelized onions (leaving about 1 tbsp. onions for garnish). 4) Transfer to a mixing bowl. Garnish with remaining caramelized onions and chopped herbs. Serve with carrots and celery. If you’re in the mood for something crunchy, our favorite brand is Simple Mills and KNOW Foods.